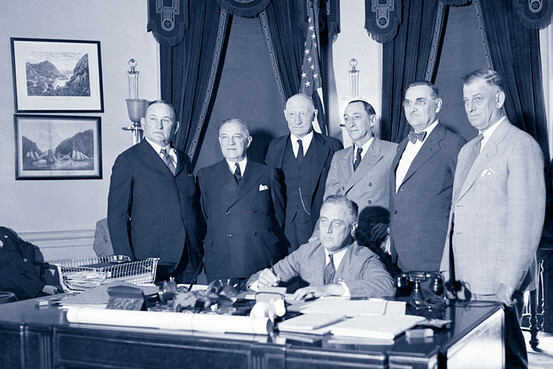 In response to the Great Depression, President Franklin D. Roosevelt created many programs designed to put Americans back to work. 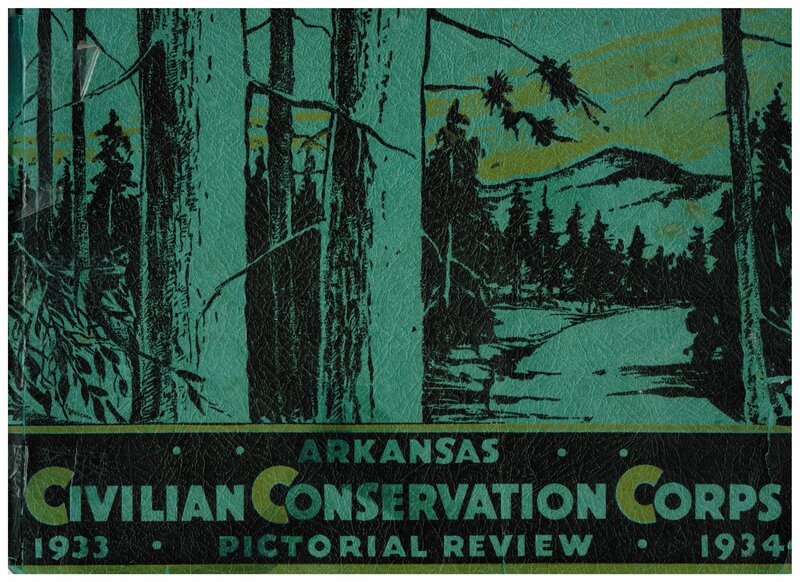 The Civilian Conservation Corps (CCC), one of the first emergency agencies, was established in early 1933. 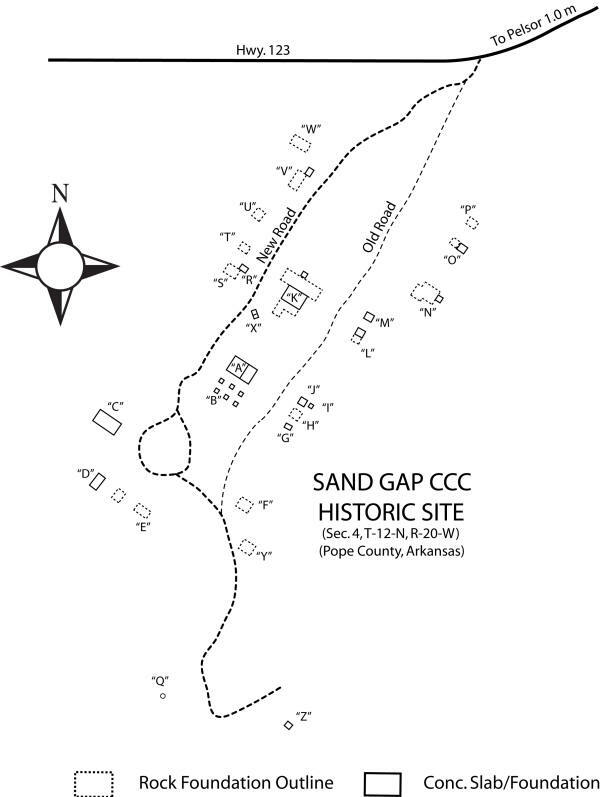 At one time there were 37 CCC camps established in Arkansas. 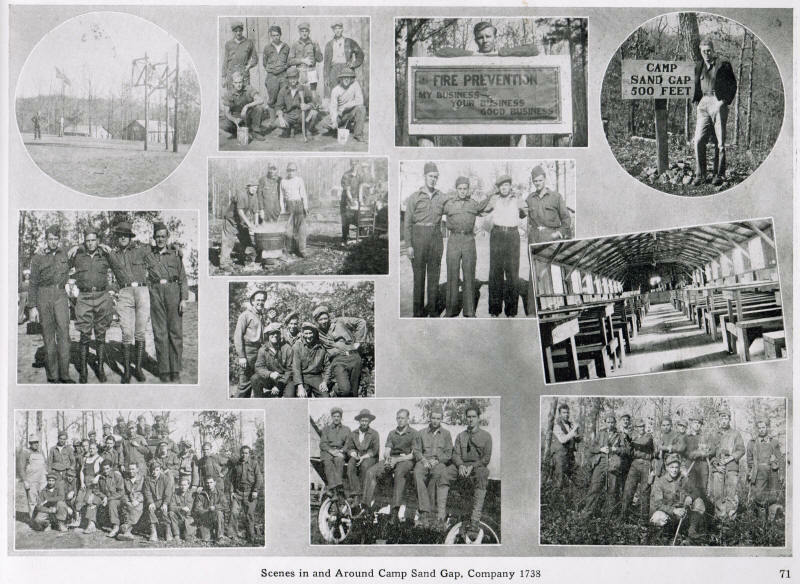 Nine of those camps were located in the Ozark National Forest. 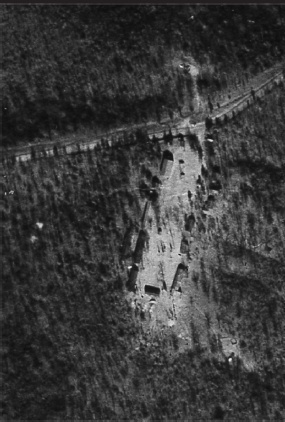 War I surplus pyramid tents or wooden barracks. They worked 40 hours per week and were required to keep their camps neat and orderly. they built picnic areas, campgrounds and observation towers, such as the one that used to be located at Fairview Campgrounds on Hwy. 7 north of Pelsor. the Forestry Commission with the very first forest inventory. Fairview Campground Fire Tower and Nursery, Ozone Recreation Area and White Rock Mountain. 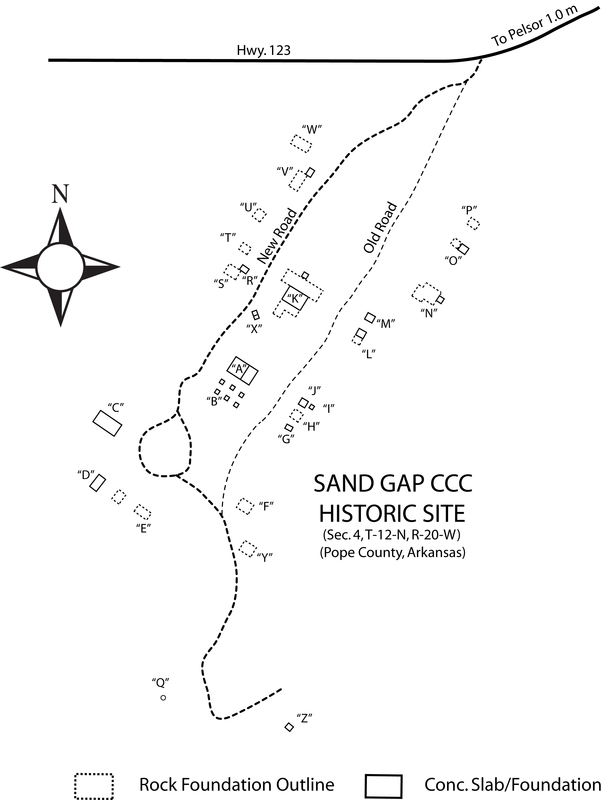 Sand Gap is the site of a major CCC camp (3PP0184). It was organized on June 28, 1933, Project #F-19 for Company #1738. It was used until 1938. 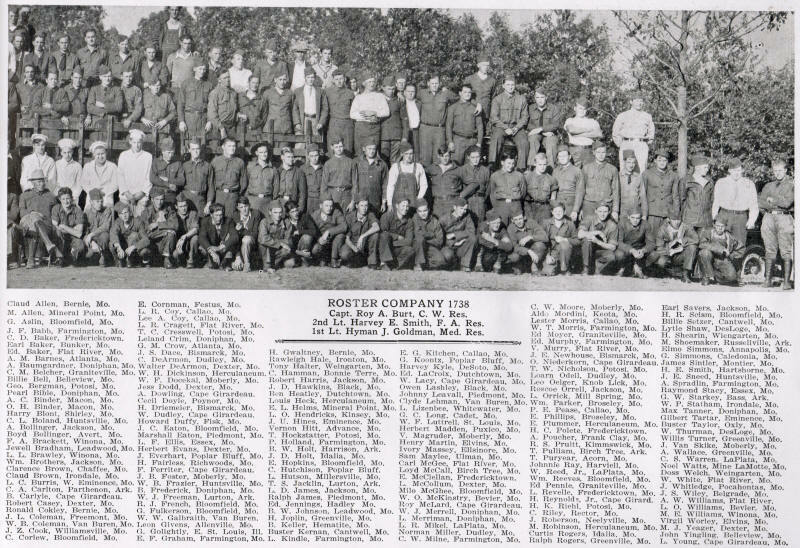 The old Mess Hall was used as a Veterans of Foreign Wars (VFW) post until it burned in 1964 or 1965.
possibly housed the camp dining hall and kitchen and stone retaining walls below many of the stuctures. Some of the foundations are in good condition. Jonquils can be found at the CCC site, which are not native to this area mark old pathways and meander along the stone retaining walls. rock walls, not shown, and rows and rows of Jonquils that were blooming at the time of my visit on 4/8/15. 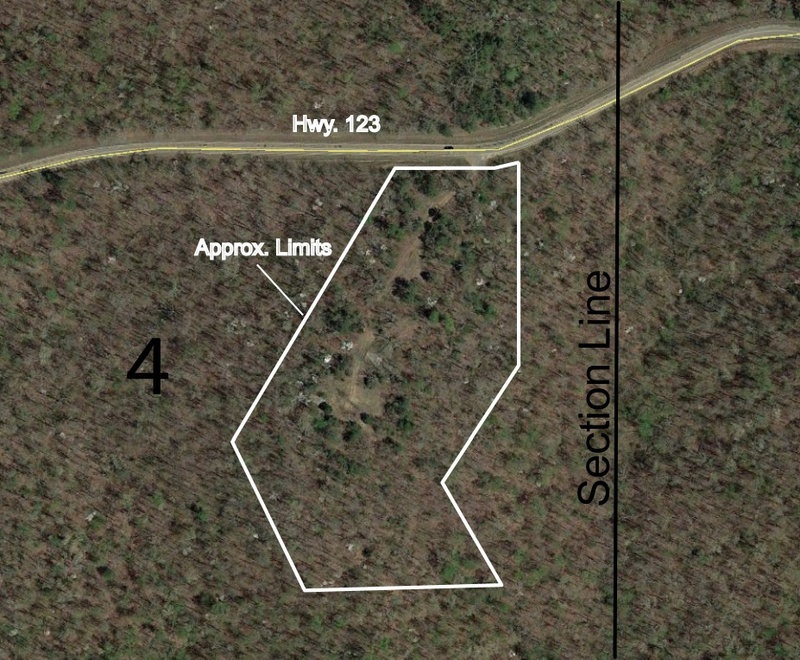 of Section 4, T-12-N, R-20-W, Pope County, AR. Thought to be the kitchen. Located just south of "A"
Appears to be a dug well? Lying on a pick of rocks? "K" This is one of the largest structures on site. slab with a pipe riser next to it. "K" Two other pipe risers on the slab. One appears to be a gas riser? Broken off pipe in concrete? Pipe driven next to rock foundation? the right appears to be gas? Flue or funnel or something? Jonquils along the top of some of the rock walls. and have come up every year since? "S" Rock Foundation attached (15'x20') Not shown. "X" Note pipe on left side. Trash pile between "F" and "Y"
"Q" Looking down into well. From end of road looking down the hillside. "Z" The water was cold and tasted great! heads down towards the spring? An open gallon can of beans? 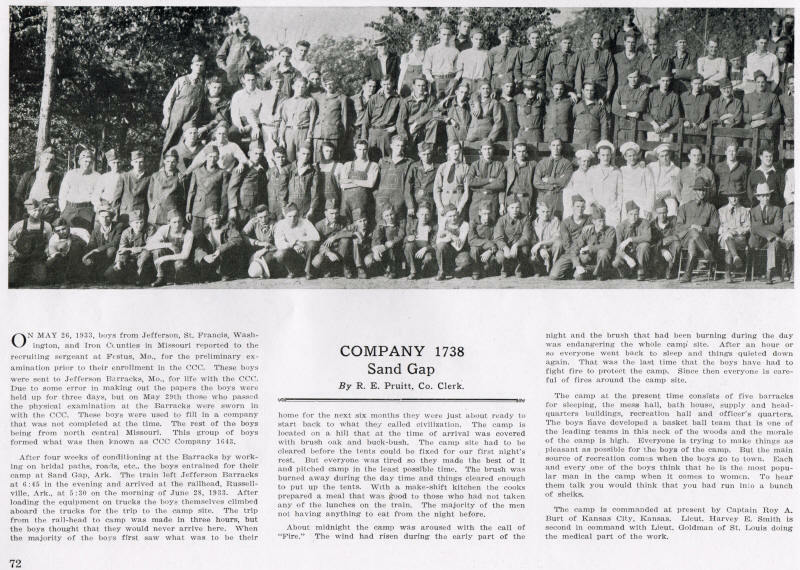 Click on the above picture and read a story of the Sans Gap Camp.